Browsing articles tagged with "Twan's List | new years eve entries"
6 years ago in the unlikely location of an upstairs warehouse turned boxing ring, a tradition began. That tradition is one family, love, music, and celebration. From that humble origin, Nexus has evolved into an event that incorporates the best in music, art, and expression that Los Angeles has to offer. This year, the tradition continues as Ninja Skillz Music, Project Alma, and The Cruz Coalition team up to bring you one of the most exciting events that we have ever put together. Those of you who remember the Nexus location from 2 years ago know exactly what we are talking about. Fully permitted till 4am, full bar, an amazing lineup, and YOU. Because lets face it, YOU are the ones that make this a tradition. So join us once again as we cast out the old and welcome the new with the open heart that makes our community great and with the love that makes Nexus a tradition. 1st and 2nd tier presales are now sold out! We made another 100 presales available today! 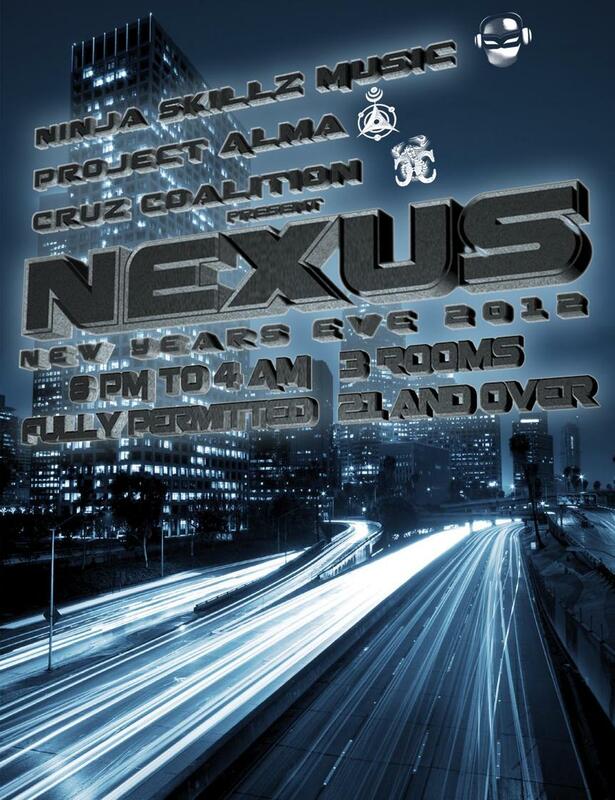 For years NEXUS has been one of the premiere NYE events in LA! Also featuring a lounge hosted by Jacques the Ripper! Soon, Beats Antique will blow the lid off Club Nokia with their special New Years Eve “Eve” celebration featuring 4 stellar artists on one stage: Beats Antique, Emancipator, Random Rab and Lynx!